Here at Lakedale Resort, we are very excited to welcome our newest addition to our collection: The Yurt Village! 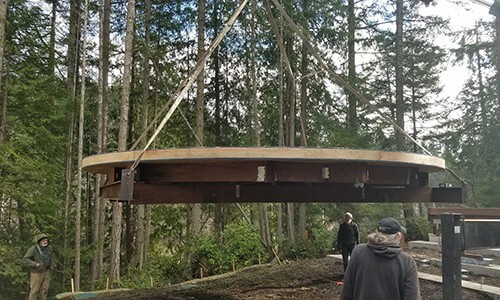 Early in Spring, we’re still in the construction phase of our new village, but we wanted to give our fans a preview of these new accommodations, as well as a peek into the thought process that went into our decision to build Yurts, and how they fit into our already dynamic culture here at the resort. 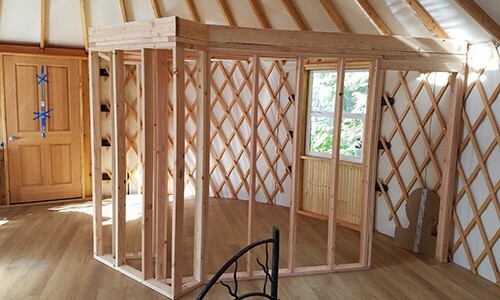 The history of the Yurt can be traced back thousands of years to nearly six centuries before the Common Era. The first recorded mention of a yurt comes from the Greek historian Herodotus, in his writing about the Scythian horse lords that roamed near the Black and Caspian Seas. Marco Polo, during his travels across the world’s largest continent, recorded the yurt’s extensive use among the nomadic Mongolian people of Central Asia. He noticed their sturdy, round tents made of rods and felt that could be easily assembled and disassembled, then loaded onto carts whenever movement was necessary. While most people conjure images of the most basic and simple dwellings when they think of yurts, some yurts were much more than basic and simple. Genghis Khan, the founder of the Mongolian Empire, still the largest empire in human history, was rumored to have lived in a massive, luxurious yurt that was mounted on wheels, and pulled from place to place by 22 oxen. If you were a herder, or an emperor, a yurt was what you called home. No, seriously, the word “yurt” (or “ger” in Mongolian) literally means “home”. When it came time for Lakedale to get on the right side of history and build our own yurts, we spent a lot of time reimagining the concept. We wanted to keep the feel of the classic yurt while adding amenities that our guests would enjoy, or have come to expect in the modern world. As with our Canvas Cabins and Cottages, we once again reached out to Rainier Industries for help. 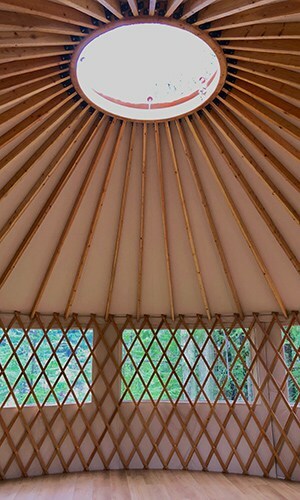 Our vision was manifested in the form of seven, 24-foot yurts, each surrounded by its own large deck. On each of those decks, our guests will enjoy tables and chairs, a BBQ grill, and their own personal hot tub! Inside, each yurt is furnished with a King bed, a Queen sofa-sleeper, a wet bar with refrigerator, and of course, a full bathroom. front of the tube all day, and will still enjoy the activities that Lakedale and the rest of San Juan Island have to offer. And don’t worry, unlike their historical predecessors, Lakedale’s yurts won’t require their inhabitants to disassemble them at the conclusion of their stay! We’ve come to realize that these things can mean completely different things to different people. Whether it’s camping or glamping to get away from the daily grind, getting together with friends and family in a Log Cabin, or spending a romantic weekend in the Lodge with that special someone, we’ve always had a lot of the bases covered. Remember that the word “yurt” means “home”? Welcome to Lakedale Resort, your Yurt away from Yurt!